Diabetes is a disease where blood sugar levels are too high because the body can no longer make or use insulin properly. The condition could lead to serious complications and even death. An estimated 29.1 million Americans have diabetes, according to the Centers for Disease Control and Prevention. There are several types of diabetes, including Type 1, Type 2 and gestational — a type that occurs in pregnant women. All forms of diabetes involve high blood sugar levels. Type 1, an autoimmune disorder, is rare compared to Type 2. Type 2 is the most common, and about 95 percent of all people with diabetes in the U.S. have this type. 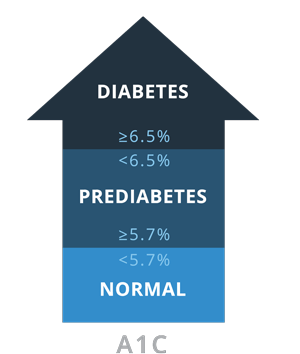 An additional 86 million adults in the United States have prediabetes, a condition where your blood sugar is high but not elevated enough for a diabetes diagnosis. Cases of diabetes increase each year, and every 19 seconds doctors diagnose someone in the U.S. with the disease. The Centers for Disease Control and Prevention (CDC) estimates that 1 in 3 adults may be diagnosed with diabetes by 2050. It’s important to keep blood sugar levels controlled because it can cause serious health problems — including kidney disease, heart problems, skin problems and limb amputations. Even if Type 2 diabetes has no cure, it can be prevented and managed. People with the disease can control blood sugar with lifestyle changes and medication. Type 1 diabetes is when the body simply does not make insulin. This type makes up about 5 percent of individuals living with diabetes. Type 2 diabetes is generally the result of a person’s body not producing or using insulin as efficiently as it once did (known as insulin resistance). Type 1 was previously known as “juvenile” diabetes. This is because Type 1 is most often diagnosed in children and young adults, although it can appear at any age. Type 1 diabetes occurs when the immune system mistakenly attacks and destroys healthy tissue. An illness, such as an infection or virus like mumps, measles, rubella or the flu, or another trigger, can cause the body to turn on itself, mistakenly attacking cells in the pancreas that make insulin. Type 1 is a life-long disease with no cure and no chance of remission. Treatment involves daily insulin injections. The exact cause of Type 1 diabetes is unknown. Type 2 diabetes is a disease in which your body loses its ability to produce and use insulin, a hormone made by the pancreas that the body uses to convert glucose into energy. Without the right amount of insulin, excess sugar builds up in the body and causes a number of health problems. Where Type 1 typically occurs in younger people and is an immune disorder, Type 2 most often occurs later in life. In fact, the medical community used to call Type 2 diabetes “adult-onset” diabetes. Most people with Type 2 are 60 and older, but doctors are diagnosing younger people with the disease. About 3.7 percent of adults aged 20 to 40 have the disease. Type 2 diabetes is a progressive disease. This means that it may worsen over time and require higher doses of medication or multiple medications to control blood sugar. 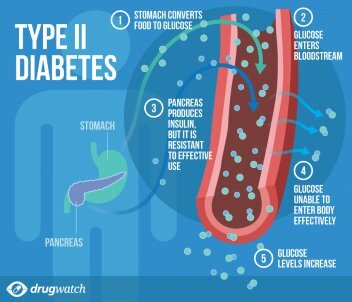 The pancreas may stop producing insulin altogether, and this means a person with Type 2 will need to inject insulin along with other medications. Drs. Frederick Banting, Charles Best, then Banting's assistant, and Professor J.J.R. Macleod extract insulin from dogs and discover it lowers blood sugar in dogs without a pancreas. James Collip purifies insulin for use in humans. Banting and Macleod win the 1923 Nobel Prize in Physiology or Medicine for their discovery. Elli Lilly and Company is the first company to commercially produce insulin. The American Diabetes Association funds its first research grants. Urine glucose testing tablets become widely available. Oral medications called sulfonylureas that stimulate the pancreas to produce more insulin hit the market. Drs. Solomon Berson and Rosalyn Yalow discover a way to measure insulin in the blood and identify "insulin-dependent" (Type 1) and "non-insulin-dependent" (Type 2) diabetes. The first color-coded glucose test strips hit the market. The first glucose meter becomes available. Researchers discover insulin receptors, and defective receptors are linked to possible insulin resistance in Type 2 diabetes. Link between hyperglycemia and blood vessel disease discovered. Researchers use E. coli to produce insulin identical to human insulin. Diabetes is classified into Type 1, Type 2, gestational and diabetes associated with other conditions. FDA approved human insulin made by genetically altered bacteria. Metformin becomes available in the U.S. The drug Precose hit the market. Eli Lilly introduces the fast-acting insulin, Lispro. Rezulin (troglitazone), the first of the thiazolidinedione class of diabetes drugs, hit the market. It was later removed from the market because of liver toxicity. Actos (pioglitazone), a drug in the same class, is available on the U.S. market, and some studies link it to bladder cancer. Prandin (repaglinide) a drug in the meglitinide class, hits the market. The American Diabetes Association defines prediabetes. Byetta (exenatide) is the first incretin mimetic GLP-1 drug on the market. 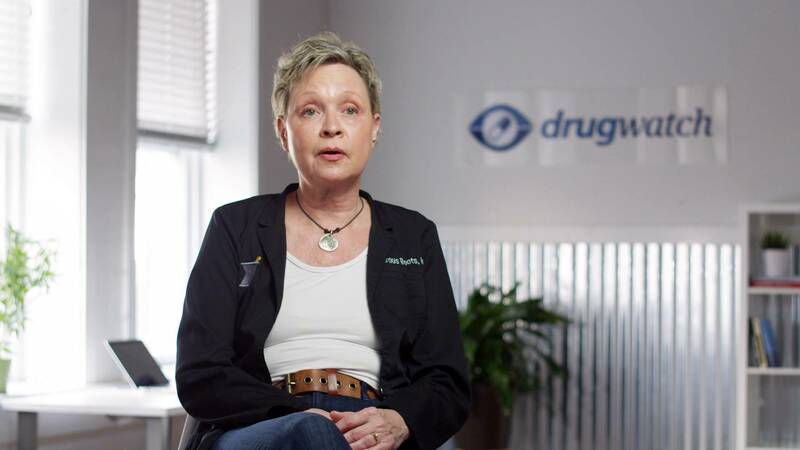 FDA approves Januvia (sitagliptin), the first DPP-4 inhibitor. Invokana (canagliflozin), the first SGLT2 inhibitor is available in the U.S.
FDA approves first automated insulin-delivery device (artificial or bionic pancreas) for patients 14 and older with Type 1 diabetes – Medtronic’s MiniMed 670G hybrid closed-looped system. Type 1 and Type 2 diabetes share similar symptoms. But Type 1 patients tend to experience symptoms sooner than Type 2 patients. This is largely due to that fact that the pancreas of a Type 1 patient does not produce insulin at all. Therefore, individuals with this form of the disease are affected much sooner and more intensely than those with Type 2. Type 2 patients actually make greater amounts of insulin for some time as insulin resistance builds. Eventually the body cannot keep up with the increased demand, insulin production begins to decline and Type 2 diabetes results. Typically, in patients with Type 1 diabetes, their symptoms result in a diagnosis, whereas those with Type 2 may not even have symptoms or be aware of a problem until they are diagnosed. What are some of the symptoms your patients with type 2 diabetes describe? Patients with Type 1 diabetes are more likely to experience symptoms of hypoglycemia, or low blood sugar, than people with Type 2. This dangerous drop in blood sugar levels is usually due to patients with Type 1 taking more insulin than needed. Exercise, although still considered a lifestyle choice, can cause low blood sugar levels in people with Type 1 diabetes. A drop in blood sugar can happen quickly in patients with Type 1 using insulin. Symptoms of hypoglycemia usually appear when a person’s blood-sugar level falls below 70 milligrams per deciliter (mg/dL). These symptoms include headaches, hunger, nervousness, irritability, rapid heartbeat (palpitations), shaking, sweating, weakness, tiredness and nausea. Although the cause of Type 1 is unknown, there may be a hereditary component. The tendency to develop autoimmune disorders, such as Type 1 diabetes, is typically passed down from one family member to the next, meaning some people may simply be more genetically prone to acquiring the disease. This seems to especially be the case for children born to fathers with Type 1 diabetes, according to one large family study of diabetes. A certain genetic marker that has been shown to make a person more susceptible to Type 1 is located on a specific chromosome known as chromosome 6. A chromosome is a threadlike structure contained in the nucleus – the central part of a cell – where genetic information is held in the form of genes. The genetic connection for Type 1 is situated on chromosome 6 in the form of a human leukocyte antigen (HLA), which is a gene complex that encodes (produces) certain proteins responsible for the regulation of a person’s immune system. However, having one or more of these HLA complexes does not always lead to the development of Type 1 diabetes. A genetic predisposition to Type 1 is just one factor among other possible risk factors making it more likely a person will develop the disease. In the U.S., Caucasians seem to be more susceptible to Type 1 than African-Americans and Hispanic-Americans, while people of Chinese and South American descent seem to have a lower risk of developing Type 1 overall. Northern climates seem to be at a higher risk for developing Type 1, especially in the winter months compared with a declining rate of diagnoses in the summer months. Children who are introduced to cow’s milk very young tend to have a slightly higher risk for developing Type 1 diabetes. Having an autoimmune disorder that shares a similar HLA complex to Type 1, such as Graves’ disease or multiple sclerosis (MS), can make a person more susceptible to Type 1 diabetes as well. A less common cause of Type 1 diabetes is injury to the pancreas. This injury and damage to the organ and its cells can result from toxins, trauma or surgery. Most people may be aware that being overweight increases the risk of developing Type 2 diabetes, but there are a few other factors. In fact, not all people with Type 2 are overweight. Diabetes is complex and no two people with the disease are the same. A person’s risk for developing Type 1 diabetes often cannot be lowered or prevented since the disease is the result of an immune response. Several risk factors associated with the disease are also unable to be changed, such as one’s family history, genetic makeup, race or ethnicity, or other autoimmune conditions. It may be possible, however, to prevent injury or damage to the pancreas that can sometimes result in the development of Type 1 diabetes. The pancreas can be easily injured due to its lack of protection from the ribcage. Pancreatic trauma, the term for injury to the pancreas, is most often caused by a car accident or a direct blow to the abdomen. The trauma that occurs can be the result of blunt force or penetration. If a pancreatic injury is suspected, it is important to seek immediate medical attention, especially where there is blood loss, persistent abdominal pain or other symptom. Those conditions might include, inflammation, bruising , dizziness, nausea and vomiting. Signs and symptoms of a pancreatic trauma can surface hours or even days after the injury occurs. Surgery is often necessary to treat an injury to the pancreas that results in symptoms. Pancreatic injuries can sometimes become life-threatening. Acute pancreatitis is the sudden swelling and inflammation of the pancreas caused by enzymes in the organ eating and digesting its own tissue. This results in swelling, bleeding and eventual damage to the pancreas. Certain diseases, surgeries and habits, such as alcoholism or alcohol abuse, make a person more likely to develop the serious condition that results in severe injury to the pancreas. Avoiding alcoholic drinks, smoking and fatty foods, and talking to your doctor about the risks of taking certain medications, can help to avoid pancreatitis or keep it from recurring after an attack. The most effective ways to lower your risk of Type 2 diabetes are by making smarter food choices and increasing your physical activity. Experts recommend at least 30 minutes of activity each day. Of course, it is not always easy to make these changes overnight. The American Diabetes Association recommends making these changes over time so you can adopt them as a lifestyle. Set realistic goals and start slow. Set a timeframe to complete them. Reward yourself for accomplishing goals. One misconception about lowering your risk by losing weight is that weight loss has to be significant, such as 50 to 100 pounds. The truth is losing as little as 10 pounds can have a dramatic impact on health and diabetes risk. Symptoms of Type 1 diabetes generally develop early in life, when people are in their teens or when they are young adults. Type 2 symptoms generally develop later in life. However, because the symptoms of Type 2 diabetes seem mild or might not appear at all, many people don’t know they have it. The American Diabetes Association estimates that 8.1 million people may be living with undiagnosed Type 2 diabetes. Many health care professionals can check for diabetes with simple blood tests. There are three main tests for diagnosing diabetes, both Type 1 and Type 2, and prediabetes: fasting plasma glucose (FPG), A1C and oral glucose tolerance test (OGTT). This test measures levels of fasting blood sugar. Patients should be fasting for at least 8 hours prior to the test. This is the most popular test. This test measures average blood glucose over the course of 2 to 3 months. It is a simple blood test and, like the FPG, patients must be fasting. Doctors may opt to do both FPG and A1C tests at the same time. Patients must be fasting with the OGTT. OGTT can also diagnose gestational diabetes. The patient’s blood glucose is measured before and after drinking a special sugary drink. Ketone testing is another diagnostic method sometimes used to diagnose diabetes. This test is performed using a sample of the patient’s blood or urine. 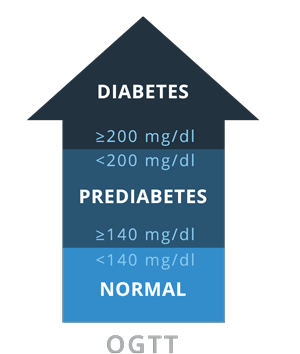 Ketone testing is generally used in diagnosing Type 1 rather than Type 2 diabetes because ketones in the urine are more commonly seen in patients with Type 1. Ketones are chemicals produced when the body burns or breaks down fat for energy, or fuel. When the body lacks enough insulin to convert sugar, or glucose, to energy, it must break down fat instead. During this process, ketones form in the blood and infiltrate the urine, often making the patient sick. Ketones in the urine, therefore, are a sign that the body is using fat instead of glucose for energy, thereby signaling that there’s not enough insulin and that as a result, a patient’s blood glucose level is likely too high. A diagnosis of diabetes is serious, but with the right help people can take the correct steps to maintain their health. A diagnosis may mean many changes in lifestyle, but it doesn’t mean life is over. For example, the American Diabetes Association has a number of great resources to help make sensible lifestyle changes. Many people may feel it is their fault they got Type 2 diabetes. But, this isn’t true. What is true is that they must be more vigilant about their health. To that end, it is important to find the right professionals to help you manage your blood sugar. This may include your doctor, nurse, pharmacist, dietitian and diabetes educator. The diabetes care team can help create a treatment plan that works. When doctors first discovered diabetes in the early 1900s, there were few options for treatment. It wasn’t until the 1990s that people with Type 2 diabetes had oral medications like metformin— still a mainstay of treatment for many people with diabetes. Insulin, a necessary treatment for patients with Type 1 diabetes, remains one of the biggest medical discoveries to this day. Prior to its unearthing in the early 1920s, led primarily by Dr. Frederick Banting of Toronto, Canada, diabetes was a dreaded disease that led to certain death. A strict diet to minimize sugar intake, which sometimes caused death by starvation, was the most effective treatment, possibly buying patients a few more years to live. Banting and one of his colleagues were awarded the Nobel Peace Prize for their discovery in 1923. That same year, drug manufacturer Eli Lilly started large-scale production of insulin, producing enough to supply all of North America. Now, in addition to injected insulin, there are a number of oral medication classes to choose from, all with their own benefits and risks. But diet and exercise are still an important part of both Type 1 and Type 2 diabetes treatment. Now, even special types of surgery can help people with both types of diabetes manage their blood sugar. A doctor may recommend one type of treatment or a combination of the three. When changes in diet and increased physical activity are not enough to control blood glucose levels, doctors will prescribe medications. These same medications, aside from insulin, are not used, however, to treat patients with Type 1 diabetes. Insulin is the only medication prescribed to treat Type 1 diabetes, and Type 1 patients are required to take the hormone replacement daily. However, there are several different types, or classes, of medications available to treat Type 2 diabetes. Each controls blood sugar in different ways. Some people may take more than one medication to more effectively control sugar levels. There are many medications to treat Type 2 diabetes, and typically they are organized into groups that represent the condition that they target. These drugs are then organized into classes by mechanism of action. A new class of diabetes medications called sodium-glucose co-transporter 2 (SGLT2) inhibitors release excess glucose in the body through urination. 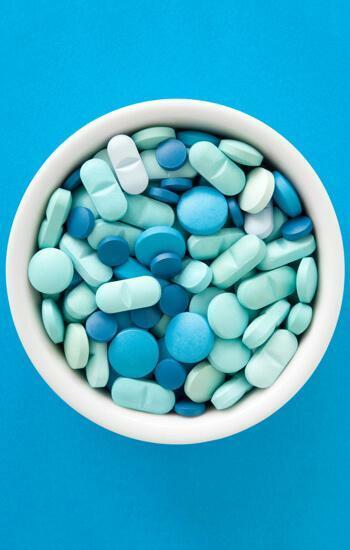 The FDA approved Invokana (canagliflozin), the first drug in the class, in 2013. Several others followed. But the agency has also released a number of warnings for serious side effects linked to these medications. The FDA warned UTIs caused by SGLT2s can lead to other serious infections. The first is urosepsis, a serious systemic blood infection that can be fatal. The second is pyelonephritis, a serious kidney infection. Pyelonephritis may also lead to a blood infection. Both types of infection require hospitalization and antibiotics. 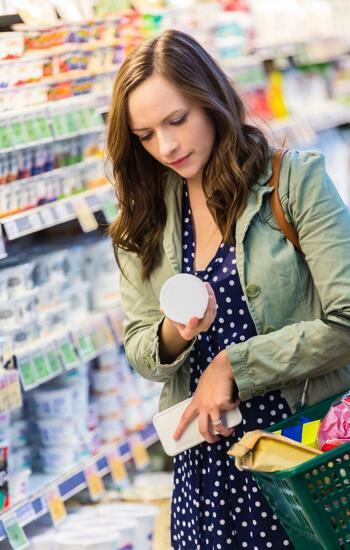 Additional FDA safety communications warned about kidney injury and diabetic ketoacidosis, a condition that occurs when too many toxins build up in the blood. New studies also show these drugs may also cause acute pancreatitis, a condition caused by the swelling and inflammation of the pancreas — the organ that produces insulin. Biguanides are a class of drugs that work by making the body more sensitive to insulin. They also stop the liver from making glucose and releasing it into the blood. They may also make fat and muscle cells more insulin sensitive. Currently, there is only one drug in this class available on the market: Glucophage (metformin). This is one of the most widely used Type 2 diabetes medications in the world. Since it has been around since the 1920s, its side effects are very well known. It became available in the U.S. in the 1990s. Many doctors are very comfortable prescribing it as a frontline medication or in combination with other medications. In fact, most combination oral medications contain metformin. Newer drugs also test their effectiveness against metformin in clinical trials. TZDs work by decreasing blood glucose levels by making muscle, fat and liver cells more sensitive to insulin. The FDA approved many of these drugs in the 1990s. The two most popular drugs in this class are Actos and Avandia. But these drugs were linked to serious side effects including bladder cancer and heart failure. It has been one of the most popular drugs in the United States for treating Type 2 diabetes since 2007. It has only been on the market since 1999. The drug recently came under fire for causing an increased risk of congestive heart failure and its link to bladder cancer. The drug’s maker, Takeda, paid $2.37 billion to settle thousands of lawsuits by people who claimed Actos caused their bladder cancer. This drug comes from the same controversial class of drugs as Actos, and works in a similar way. Studies link it to an increased risk of heart failure. A number of countries in Europe stopped selling the drug and banned it. Although not banned in the United States, it can only be prescribed by a small group of doctors. These drugs stimulate the pancreas to produce more insulin. There are several well-known Type 2 diabetes drugs that use sulfonylureas as their base. These include Glucotrol (glipizide), Diabeta (glyburide) and several others. The FDA approved the first of these drugs in the 1980s. These work to decrease blood glucose levels by stimulating insulin release by the beta cells in the pancreas. Pancreatic beta cells are the cells primarily responsible for releasing insulin. One of the issues with Type 2 diabetes is glucose entering the bloodstream faster than the body can process it. Slowing the digestive process of starches and sugars slows down the rate that glucose enters the bloodstream. These drugs slow the digestion of sugar. Because these medications affect the digestive system, side effects of nausea and flatulence are common. Alpha-glucosidase inhibitors are the least effective medications for lowering blood sugar and are rarely used in the United States. Precose (acarbose) and Glyset (miglitol) belong to this class. Amylin analogues also have a modest effect on blood sugar, and are injected with a dosing pen. The only product available is called pramlintide. These drugs keep the hormone incretin from being broken down, stimulating insulin production and slowing digestion. Popular brand names are Januvia, Onglyza and Tradjenta. Generic names are sitagliptin, saxagliptin and linagliptin. Side effects include: joint pain, pancreatitis, sore throat, swelling of hands or feet, nausea, hypoglycemia and diarrhea. Everyone with Type 1 diabetes must take insulin every day. However, patients diagnosed with Type 2 diabetes sometimes need to take insulin as well, when oral medications taken along with diet and exercise, are no longer enough to control the disease on their own. Some reasons why people with Type 2 may need to start taking insulin, even if just temporarily, often involve other health conditions, injury, medication use or any other physiological change that can cause an individual’s body to become unable to produce enough insulin. Insulin is injected under the skin (called a subcutaneous injection) using a syringe, insulin pen or insulin pump. The abdomen is the preferred injection site due to a more consistent absorption of insulin occurring in this region. However, the location for injections should be rotated regularly to avoid a condition called lipodystrophy, or erosion of the fat beneath the skin. Other popular injection sites include the thigh and the arm. Insulin is not available to be taken in an oral form because stomach acid destroys the hormone. However, there is an inhaled version of the drug sold under the brand name Afrezza. This is a powder that is breathed in just before a meal (rapid-acting). In patients with Type 2 diabetes, insulin may be stopped if temporary situations necessitating its use are resolved, or sometimes with weight loss, exercise or other lifestyle changes. Patients with Type 1 diabetes will never be able to stop taking insulin, although doses may be adjusted. There are four different types of insulin that work differently for patients with diabetes — rapid-acting, short-acting, intermediate-acting and long-acting. Rapid-acting and short-acting insulins are often used in combination with longer-acting insulins. Both rapid- and short-acting insulins are taken shortly before meals (usually about 30 minutes prior) to cover the rise in blood glucose levels that results from eating. Intermediate- and long-acting insulins cover any elevations in blood glucose levels after the shorter acting insulins stop working. Intermediate-acting insulin is usually taken twice a day, while long-acting insulin is taken once or twice a day. The following chart breaks down the different types of insulin and how they work. Insulin is generally considered safe to take. It is even the preferred drug, over oral drugs, to control blood glucose levels during pregnancy and when breastfeeding. However, insulin is not without side effects. Hypoglycemia (low blood sugar) is the most common side effect experienced in patients taking insulin. Healthy eating helps keep blood sugar down and is a critical part of managing both Type 1 and Type 2 diabetes, according to the National Institutes of Health. In fact, healthy eating is a part of a diabetic patient’s treatment plan, along with insulin for primarily Type 1 patients or another prescribed medication for patients with Type 2. Type 1 patients are also required to count carbohydrates and frequently monitor their blood sugar levels. Type 2 patients should be mindful of their blood sugar levels before and after eating as well. The NIH recommends talking to a registered dietitian or nutritionist to develop an eating plan that works around each individual’s lifestyle, weight, medicines and other health problems. The National Institute of Diabetes and Digestive and Kidney Diseases has tips for healthy eating. Exercise is also beneficial for controlling blood glucose. Both Type 1 and Type 2 patients can benefit from exercising regularly and maintaining a healthy weight. A personal trainer or a diabetes expert can help you set meaningful goals. An exercise plan does not have to be strenuous to impart benefits. What is type 2 diabetes and describe the disorder’s link to diet and exercise? In fact, new research in the journal Diabetologia shows that short 10-minute walks after meals can help lower blood sugar. Researchers at the University of Otago in New Zealand found these short walks after meals helped control blood glucose better than a single 30-minute walk by 12 percent. Other 2016 research in Diabetologia by Dr. Bernard Duvivier of Maastricht University in the Netherlands found simply sitting less and by standing more and doing light walking may control blood sugar better than higher intensity exercise. Exercise can cause blood sugar levels to drop, especially in diabetic patients taking insulin. Patients with diabetes should regularly monitor their blood sugar levels before, during and after physical activity to make sure they don’t get too low. Additionally, after administering insulin, strenuous activity can potentially speed up the body’s absorption of the hormone. Patients who plan to exercise following an insulin injection, should not inject themselves in an area that is most likely to be affected by the activity. For example, patients who plan to go running soon after the injection of insulin, should not inject the hormone into their thigh. Bariatric surgery is growing in popularity as a treatment for Type 2 diabetes. There are a few methods of performing the surgery, but they all involve shrinking the size of the stomach or rerouting the path of food. The most familiar type of surgery is gastric bypass. It creates a small pouch at the top of the stomach about the size of a walnut. The surgeon then reconnects the small intestine to this new walnut-sized stomach. One study published in 2011 in Diabetes Care showed the surgery is highly effective in very obese patients with Type 2 diabetes. A review of clinical literature showed diabetes death rates lowered by up to 90 percent after gastric-bypass surgery. Overweight patients with poorly controlled Type 1 diabetes may make good candidates for surgery as well. Such operations may give Type 1 patients greater control over the disease — not a cure. They may experience a possible reduction in daily insulin doses, according to a review of cases from the Cleveland Clinic in Ohio. One study conducted at Cleveland Clinic showed that 9 out of 10 morbidly obese patients with Type 1 who underwent a laparoscopic procedure, such as a gastric bypass, lost more than 60 percent of their body weight in more than three years’ time. These patients also saw improvements in all cardiovascular risk factors, such as hypertension (high blood pressure) and triglyceride levels (the most common type of fat found in the blood). Farxiga side effects include bladder cancer, ketoacidosis, kidney injury and serious urinary tract infections. Some patients have died. SGLT2 inhibitors like Invokana and Farxiga are used to treat Type 2 diabetes. However several studies have linked these drugs to serious conditions. SGLT2 inhibitors like Invokana and Farxiga, are popular Type 2 diabetes drugs, but FDA released several safety communications about side effects. Diabetes is a serious condition that can result in serious complications if not managed properly. All diabetes complications are the result of poorly controlled blood glucose levels. When blood glucose levels are controlled in both patients with Type 1 and Type 2 diabetes, short- and long-term complications can be prevented or postponed. One of the most common short-term diabetes complications, especially in patients with Type 1 diabetes, is hypoglycemia, or low blood sugar. This is due to taking too much insulin or not properly planning insulin intake around meals and/or exercise. Certain medications, such as aspirin, and alcohol can sometimes cause hypoglycemia in patients with diabetes, as well. While many people with Type 2 diabetes might not immediately notice symptoms of the disease, it can still cause serious complications if left untreated. Even after diabetes complications develop, maintaining control over one’s blood sugar levels can assist in managing symptoms and preventing additional problems. While diabetic ketoacidosis (DKA) is a side effect of some Type 2 diabetes medications such as Invokana, people with both Type 1 and Type 2 diabetes are at increased risk even without taking the medication. Lack of insulin production can lead to DKA. This occurs when the body cannot use glucose for fuel and burns fat instead. The byproducts of breaking down fat for fuel are called ketones. When ketones build up in the body, they become toxic. This condition is rare in people with Type 2 diabetes, though, and usually affects people with Type 1 diabetes whose bodies do not produce insulin at all. Sometimes, people do not realize they have diabetes until they develop DKA. People with both types of diabetes are at increased risk for pancreatitis (swelling of the pancreas) and pancreatic cancer. Acute pancreatitis may happen suddenly and symptoms include pain in the abdomen, nausea, fever and rapid heartbeat. Chronic pancreatitis develops over time and symptoms include oily stools, diarrhea, weight loss and vomiting. One study published in Diabetes Care found that people with Type 2 diabetes were almost twice as likely to have acute pancreatitis as people without Type 2. But researchers found insulin slightly decreased this risk. Pancreatitis can lead to pancreatic cancer. Diabetes can be a risk factor or a symptom of pancreatic cancer. Typically, this type of cancer is more prevalent in people who have had diabetes for more than five years, according to the Pancreatic Cancer Action Network. Researchers found that health conditions connected to Type 2 diabetes such as insulin resistance, inflammation and high blood sugar all contribute to development of pancreatic cancer. But people with pancreatic cancer may also develop diabetes as a symptom of the cancer. Some Type 2 diabetes medications may also increase the risk of pancreatitis and possibly pancreatic cancer, including DPP-4 inhibitors such as Januvia, Janumet and Victoza. Diabetes also increases mortality. Diabetes was mentioned as a cause of death on 234,051 death certificates in 2010, according to American Diabetes Association statistics. The ADA also says diabetes may be underreported as the cause of death. Uncontrolled Type 1 or Type 2 diabetes is especially dangerous during pregnancy. Not only does it affect the mother, but it can also endanger the baby. A fetus’ organs are formed within the first two months of pregnancy, often before a woman knows she is pregnant. Blood sugar that is too high (or too low) can affect the organs as they are developing leading to serious birth defects. Therefore, women planning to get pregnant should make sure they have their blood sugar under control before and during pregnancy. Women with diabetes are at a higher risk of preeclampsia during and after pregnancy. Preclampsia is one of the leading causes of child-bearing related death. Most deaths happen in the days or months after the mother gives birth. Preeclampsia can be treated. And most deaths are preventable if a woman receives treatment. Health care providers should continue to monitor women for signs and symptoms of preeclampsia after they give birth. Postpartum preeclampsia symptoms may mimic those of other conditions new mothers experience. These can include headaches, stomach problems and swelling. About seven out of every 100 pregnant women in the U.S. suffers from gestational diabetes. Gestational diabetes is diabetes that happens for the first time during pregnancy, usually around the 24th week, according to the American Diabetes Association (ADA). Gestational diabetes is not the same condition as a person already diagnosed with Type 1 or Type 2 diabetes who then gets pregnant. A diagnosis of gestational diabetes does not mean that a woman had diabetes prior to conceiving. Additionally, gestational diabetes generally goes away after pregnancy. However, it can increase a woman’s chances of developing Type 2 diabetes later in life. The infant may also be at an increased risk for obesity and Type 2 diabetes. Pregnant women are typically tested for diabetes during the second trimester of the pregnancy as a part of routine prenatal care. Gestational diabetes is caused by hormones from the placenta that block the body’s normal use of insulin and prevent the body from regulating the increased blood sugar levels that are usually associated with pregnancy. A test for gestational diabetes may be done earlier if a woman is considered to be at higher risk for developing the disease. Risk factors include being overweight, older, having a history of gestational diabetes from previous pregnancies and receiving a pre-diabetes diagnosis before pregnancy. Staying active and maintaining a normal (or healthy weight), as well as eating a healthy, well-balanced diet, are ways in which women can help prevent the development of gestational diabetes. The American Diabetes Association (ADA) is focused on improving the lives of all people affected by diabetes. While Type 2 makes up the majority of those individuals, Type 1 is a priority of the nonprofit health organization as well. In 2016, 37 percent of the nonprofit’s total research budget was apportioned to projects relevant to Type 1. One recent project, started in early 2015, that would benefit people with Type 1 as well as those with advanced Type 2 requiring insulin, is the smart insulin patch. ADA Pathway to Stop Diabetes scientist Zhen Gu, a professor in the Joint University of North Carolina/North Carolina State University Department of Biomedical Engineering, published a paper in the biomedical journal, Proceedings of the National Academy of Sciences, describing the development of the new patch that could replace painful and burdensome injections. The smart insulin patch, made of thin silicon, is about the size of a penny. It includes more than 100 microneedles, each one approximately the size of an eyelash. The microneedles house live beta cells that can sense when blood glucose levels are high and send a rapid release of insulin into the patient’s bloodstream. The live beta cells (cells responsible for making insulin) are said to reduce the risk of complications and last longer than the synthetic insulin that was previously preloaded in the patch. The final prototype is expected to include glucagon (the hormone responsible for counteracting insulin) into the device as well. This will make the smart insulin patch effective in correcting both high blood glucose levels as well as low blood glucose levels (hypoglycemia), a dangerous potential side effect of taking insulin. Scientists have tested the smart insulin patch technology in mouse models, where it was discovered that the device was able to effectively lower blood glucose levels for up to nine hours. The positive result paves the way for continuing research in live animals and eventually clinical trials for humans. British researchers published results from a small clinical trial showing immunotherapy treatment is safe for people with Type 1 diabetes. Science Translational Medicine published the findings from the study in August 2017, reporting that the immune system therapy showed promise in maintaining insulin production in people who were newly diagnosed with the disease. The immunotherapy treatment is comparable to an allergy shot in how it works in that it is supposed to stop the immune system from attacking the body, specifically the beta cells found in the pancreas responsible for making insulin. Scientists determined that people who develop Type 1 diabetes likely do not produce enough of the right kind of T-regs, immune cells that can aid in the suppression of immune attacks, or the T-regs aren’t working as they should. So, researchers developed the treatment called peptide immunotherapy using disease-related autoantigens, substances that cause autoimmune attacks, in an attempt to “re-educate” the immune system and induce more, or more effective, T-regs. The study involved 27 patients with Type 1 diabetes who had been diagnosed with the disease within the past 100 days. The participants were divided into three groups, including a group given placebos (dummy pill). Those taking the placebos increased their insulin-use by 50 percent over a 12-month period. Although, all of the participants still required daily insulin, researchers asserted that the need for less insulin over time can lessen complications and improve patients’ overall quality of life. Additional trials are needed to determine how often the immunotherapy treatments would need to be administered and what benefit, if any, it would have in people who have had Type 1 diabetes for a longer amount of time, whose beta cells are likely more severely damaged or altogether gone. Detectable C-peptide (a substance created along with insulin) levels in patients might also make a difference in this or future treatments. Researchers with the ADA are working on ways to enhance the survival of beta cells for eventual successful transplantations for patients with Type 1 diabetes. The goal of such treatment is to replace insulin injections and provide better control of blood glucose levels. Currently, there is a shortage of sufficient donor cells, further complicated by the fact that it takes several donors to transplant one recipient. The survival rate of these stem cells contained on islets, or small isolated masses of one type of tissue, is also very low, with 80 percent of transplanted islets dying from exhaustion. However, there is evidence to suggest that these beta cells can be trained to survive exposure to oxygen and nutrient shortages experienced before and after transplantation. The ADA contends that stem cell technology resulting in an unlimited source of beta cells may very well be a reality in the next several years. Research to determine how best to use these new cells, how they live and function after transplantation, and how to control the body’s immune responses to the transplanted tissue, to avoid rejection or subsequent cell and tissue death, will be essential in the potential realization of an eventual cure for diabetes. Type 2 diabetes research focuses on four main areas: education, new technology and medications, prevention of the disease and prevention of complications. In addition to government funding of research, many drug companies also conduct their own studies to find new medications for the disease. The American Diabetes Association (ADA) also funds studies. Who is at risk for Type 2 and what are the first signs of the disease? What are the physical differences between people with and without the disease? What new technologies make living with diabetes easier for patients? Why does Type 2 run in families? How can complications develop and how can they be prevented? Dr. Marilyn Corneli, a nutritionist and assistant professor at Northwestern University Feinberg School of Medicine, found people who drink coffee have a lower risk of Type 2 diabetes, and she is doing more research to find out why. Dr. Rebecca Hasson, an exercise physiologist at University of Michigan, found a link between environmental stress and Type 2 diabetes. Research suggests that when under stress, the body produces a hormone called cortisol. Cortisol contributes to insulin resistance. Dr. Laura D. Baker found aerobic exercise improves brain function in people with prediabetes. Type 2 diabetes and prediabetes are the second biggest risk factors for Alzheimer’s. Diabetes increases the risk by 65 percent. Even small amounts of exercise improve cognition.